Nowadays many people carry more than one phone, but it always creates additional load on your pockets to have two cell phones in your pockets. Apple's revolutionary device iPhone is very much common these days and it just became a fashion to have iPhone rather than the cell phone. By default iPhone only allows one SIM only to use, but in this post I'm going to share how you can use two SIM cards in your iPhone using the Dual SIM iPhone Case. The Dual SIM iPhone Case is a simple gadget that allows you an easy way to enjoy two SIM cards on your iPhone plus you can easily switch to SIM of you're like with a single click. The thing that I liked most about Dual SIM iPhone Case is that you don't require any complex jailbreaking procedure or any software to work with it. All you need is to fit your iPhone inside the casing and insert your SIM cards inside the casing and enjoy. The Dual SIM iPhone Case is compatible with iPhone 4 and iPhone 4S and more importantly you can use both standard SIM and Micro SIM cards with this useful gadget. 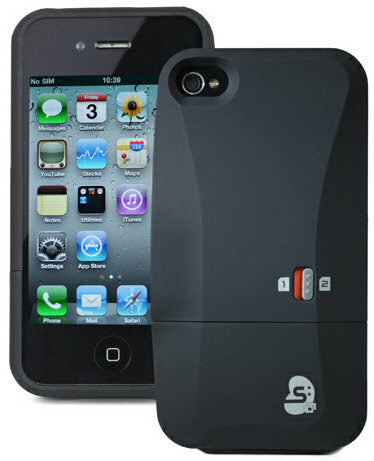 The price of the Dual SIM iPhone Case is £29.99 and it will be available next month.